Gearhouse Broadcast, a supplier of technical facilities, crew and services, has completed two studios for the Globo Group in central Moscow for its international football coverage of the World Cup soccer tournament. It has also delivered additional audio/video signal routing, standards conversion, distribution and QC monitoring facilities for TV Globo within the International Broadcast Centre (IBC) in Moscow. The Brazilian rights holder commissioned Gearhouse to provide TV equipment rental, systems integration and local tech support services for its studios in Red Square, where it has concentrated its main production facilities around the World Cup. The two studios are connected by fiber optics links to Globo’s Free TV and Pay TV broadcast centers in Rio de Janeiro, so that its programming can be cut together remotely by its production crews back in Brazil, thus achieving significant efficiency savings. Within the main studio is a complex virtual set environment that is being used to support six daily network news shows and two weekly programs aired live from Red Square. The studio has no physical scenic elements, and the presenters interact with a variety of 3D and 2D graphics elements that cover the main events for each day of the tournament. The graphics are created daily in Rio, so as to always maintain a fresh look, and are exported to Moscow through a robust data pipe using file acceleration protocols. To bring Globo’s creative vision to life within a virtual set space required the installation of two large high-resolution LED screens that feature a fine 1.2mm pitch. A Stype camera tracking system is being used to provide the lens and positional data for the cameras, which is then fed into Avid’s Maestro Graphics solution along with the video output of the six camera set up to create the virtual backdrop environments. Gearhouse built the audio/video signal routing, standards conversion, distribution and QC monitoring facilities for TV Globo within the International Broadcast Centre in Moscow. Jose Manuel Mariño Globo’s Director of Technology for Sports, said that for the Rio 2016 Summer Olympic Games, Globo surprised everyone with its studio in the center of the Olympic Park, featuring virtual and AR graphics that were both informative and eye-catching. Ed Tischler, managing director of Gearhouse Broadcast UK said his team assumed the role of technical partner to Globo, bringing together industry-leading technology and expertise to deliver cutting-edge studio build, graphics and remote production solutions. 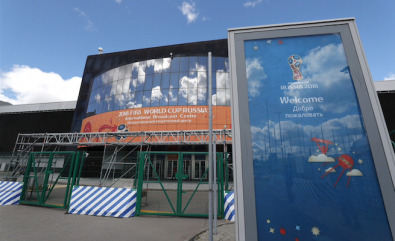 The IBC in Moscow is where the host broadcast feed for all 64 matches will be processed, monitored and delivered to viewers in 219 territories around the world. Additional content will be produced here as well: from daily highlights shows and team updates, to story features and promos. It is also the headquarters for all Media Rights Licensees (MRLs), the national and regional broadcasters that have bought the rights to show FIFA World Cup matches. In addition to the production and office space used by 78 MRLs at the IBC, there are also 13 outside presentation studios set up in Moscow’s Red Square.